Yes, my dear ones, our life is a journey; whoever does not want to advance, whoever thinks it is possible to be a Christian while standing in one place, is deceiving both himself and God. The fourth Sunday of Great Lent is dedicated to the memory of St. John of the Ladder, who was so named because he left us his teaching concerning the spiritual ladder that unites Heaven and Earth. Since that time many people, when reflecting on the human journey, have compared it to the long ascent up a high tower or, put better, up a high and impregnable mountain, the peak of which is not visible from the ground. 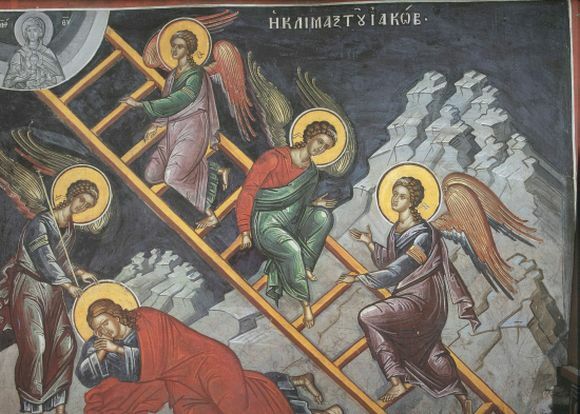 You will recall how the Lord told his first Apostles that they would see the heaven open and angels of God ascending and descending to the earth. This link fills in, as it were, the distance between people and God, between mortal, sinful people and the Creator. Who joined together Heaven and Earth? Who joined together God and man? The God-Man, our Lord Jesus Christ! And, of course, the Mother of God, who brought the Divine child into the world. In the Church’s hymnody she is the Heavenly Ladder, for the Lord descends to us through her. This means that Heaven is not so endlessly distant and not so far removed from us! There is a ladder and there are steps that we can dare to climb. Around the ancient mountains to which people came and prayed there began to settle anchorites and ascetics. This was the case with Mount Athos, Mount Sinai, and other beautiful, uninhabited places. It was at Mount Sinai, near the mountain of God, that John of the Ladder lived. He passed his days in the small monastery in prayer and labor; he thought about the entire world and the fate of people suffering from the evil reigning therein. Often in the morning, before the rising of the sun, when going out to pray, he would look up at Mount Sinai and see the dark valleys, covered by the half-light, and the sharp peaks rising into the clouds. As dawn would break, the mountain peaks would become scarlet from the rising sun, while it remained dark below. During this time pious pilgrims, either alone or in groups, would begin their ascent to the peak in order to pray in the place where the Lord had appeared to the Prophet Moses. Files of people would walk up the steep slope along treacherous, difficult trails, afraid to look down, but going upward and upward – to the summit, illumined by the sun. Then St. John compared our human life to the mountain these pilgrims were climbing. He understood the necessity of constant ascent; he understood that whoever is not moving upward will be compelled to wander downward, and will forever remain in captivity to darkness and unbelief. Yes, my dear ones, our life is a journey; whoever does not want to advance, whoever thinks it is possible to be a Christian while standing in one place, is deceiving both himself and God. Ten, twenty, sixty years will pass and, if one has done nothing for the Lord, if one has not made any headway, this will mean that these years have gone by to no avail. Others will have moved upward, others will have ascended, but such a person will have walked about in darkness and the shadow of death. It is so frightening for us to think about this because the Lord awaits us above, while there is darkness below – the darkness of sin, sloth, indolence, and heedlessness. 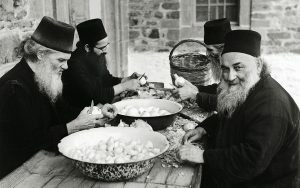 While we are standing idle – though we consider ourselves Orthodox Christians – others have far, far overtaken us. Moreover, this mountain of ascent, this ladder, is heavenly and singular. When you climb an ordinary ladder, you can stop and stay in one place, but with this one it is different. If you stop, you will descend and go backward – you cannot remain in one place. Each one of you knows for himself what happens when one stops praying. 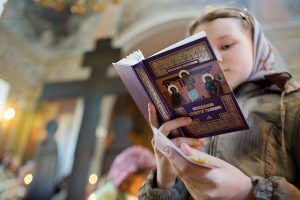 It seems that one has given up prayer because things have become too hectic, but then time passes – a week, two weeks, a month – and then how hard it is to restore one’s heart! How difficult it is to return to prayer, for one’s soul has slid backwards; it has not remained in place, but has lost what it once possessed. Only forward! Only knock at God’s door! Only ask for help on this journey! This journey is a difficult one: on one side there is the abyss of despair; on another side an avalanche of temptation threatens; on the third side are crevices of trials and temptations. But there are helpers, there are guides, and there is a roadmap to this path. Our main roadmap is Holy Scripture. Opening it, we find everything outlined for us: how to ascend to God in His Kingdom. There are also roadmaps to this path that resemble arrows pointing out the way: here is the path to the light, and here is the path to perdition. Thus, we know everything perfectly well, and everything has been given us. Finally, there are guides. What kind of guides are these? They are our defenders, advocates, friends, and elder brethren: these are the saints and monastic teachers. Their life is edifying and instructive for us; they are always alive and praying for us. An angel of the Lord watches over each one of us as well. Each one of us has his own patron saint and his own guardian angel. Remember them, knowing that they will not abandon you in the middle of the road, and then they will be able to help you. Some ask why, then, do we fall, why do we collapse, why do we tolerate getting derailed in our attempts to ascend? The answer is contained in today’s Gospel reading [Mark 9:17-31]. The Lord asks the father of the ailing youth: “Do you believe?” The latter replies: “I believe, Lord, help my unbelief.” Then the Lord healed his son. It is the same on our journey. If we have decided to entrust ourselves to God, if we have wholly committed ourselves to Him, then there will be help. But if we are fearful, doubtful, complaining, grumbling, and despondent, thinking that nothing will come of it – then there will be no help for us, for we ourselves have rejected the saving hand that God has extended to us. The second half of Great Lent is already here. Who of us knows if we will live until next Lent or, for that matter, even until this coming Pascha? Life goes by; everything passes. Let us hasten to gather the treasury into our hearts now. Let us ascend these steps now, these steps of prayer and abstinence. Then all these helpers will encircle us; then all these guides will speak up. Then the Lord Himself, Who is awaiting us upon the brilliant peak on high, will extend His hand to us, strengthening us on our difficult journey.